There's an interesting story coming out of a Rhode Island nursing home. 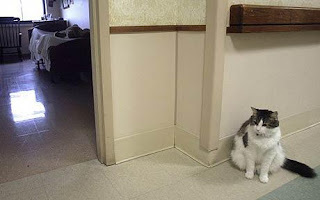 Oscar, the resident cat at the Steere House nursing home in Providence, seems to be able to predict when residents are about to die. According to Dr. David Dosa, a geriatrician and assistant professor at Brown University medical school, Oscar has been accurate with his terminal diagnoses for the past five years. In fact, Oscar sometimes knows better than the staff. When a patient is close to death, Oscar will jump on his or her bed and keep vigil. According to Dr. Dosa, he will leave for a few minutes to have some food, but will hop right back onto the bed, keeping his watch. One time nurses put Oscar on the bed of a patient who they thought was about to die, but Oscar jumped out and ran into somebody else's room. The first patient lived another two days, while the patient in the room into which Oscar ran died that night. According to the staff, the family members seem to find comfort in Oscar's presence. In fact, they will sometimes call the family when the cat takes up his post. Fortunately, Oscar has a 100% success rate in determining who is on their deathbed, otherwise I would imagine it could be a bit unnerving if he mistakenly jumped on someone's bed just to take a nap.